1. You can upgrade from the standard 2GB to 1TB storage for $139/year through Dropbox Pro, or $850/year through Dropbox Business for unlimited storage (minimum of 5 users). How does monash.figshare fit in with other university-wide systems? monash.figshare is the research data and theses repository for Monash. It allows researchers to manage, store, share and publish their research data as citable research outputs with a DOI. Researchers control who can access their data in a variety of ways. monash.figshare is used by students to submit their theses which are then verified/accepted by Library staff. myResearch is both the university research management system and the new publications repository. It stores descriptions and copies of traditional reportable research outputs and its use enables research publications to be connected with information about our researchers, their grants and projects. Researchers are encouraged to link their research outputs in myResearch to relevant items in monash.figshare. Monash Collections Online is a content management system used by Monash University Library to manage the display, promotion, and dissemination of the Library’s digitised Special Collections, showcasing Special Collection virtual exhibitions and archiving previous digital exhibitions. LabArchives is an electronic lab notebook for the day-today recording of research and replaces traditional paper research notebooks. It provides comprehensive version control and has been cleared to store confidential and critical data. LabArchives content cannot be published. How do I connect my monash.figshare account to my GitHub account? GitHub is a widely used version control repository primarily for code. Linking your monash.figshare and GitHub accounts allows you to make public the code associated with a research output, and make clear which version of the code you used. On the My data page, next to the ‘+Create a new item’ button is the Octocat GitHub icon. Clicking on the icon takes you to a page that will state you have no connected GitHub accounts. Click the ‘Connect’ button. You will be prompted to login to GitHub. Once logged in the next page asks you to click on the ‘Authorize application’ button which allows your monash.figshare account to connect to your GitHub account. This will take you back to monash.figshare and display your GitHub repositories. To import, select the repositories then click ‘Import selected repos.’ You will then have the option of adding further information or closing the item. There is also an online guide available from figshare. How discoverable is my research? monash.figshare is indexed by Google and Bing, and is searchable via figshare.com. You can increase the discoverability of your research by ensuring that your keywords are relevant and specific to your topic, and that you have fully described your work by filling in as many of the fields as possible. There is also online information available from figshare. Who can view my published research outputs? All published files on monash.figshare are publicly accessible online and reusable by others under a Creative Commons licence. Who can view my unpublished research files? Only you can view your private research files before you publish. They are not visible or accessible by anyone else. However, if you are part of a monash.figshare project, you can elect to allow project team members to view and download your unpublished research files. This is a feature designed to allow collaboration. Creating a Project in monash.figshare allows you to invite other Monash researchers to collaborate. 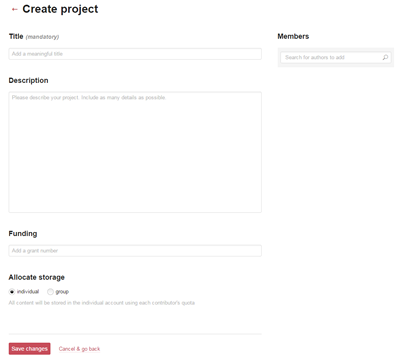 Only project members can see the descriptions and research files added to the Project by other project members until the owner chooses to make them public. All project members can view and download the research files of other Project members. To create a Project click on the Projects tab after you have logged in. Click on the '+ Create a new project icon'. This will allow you to describe your Project (title, description, funding source, etc) and invite other researchers to your project. Project members can be added as Collaborators (with editing rights) or as Viewers (they can only view data, not add to it). Where are my research files stored? All files uploaded through monash.figshare are stored at Monash University for long-term security, and to prevent lock-in to the Figshare service. What is the maximum storage size limit? All users across Monash will start with 10GB of storage. If you are approaching the maximum of your initially allocated space, you can request more storage. How do I request more storage? On the My Data tab you will see how much storage you have under the Activities tab. Placing your cursor on the allocation brings up a link (Request more?). Click this link, fill in your new quota and hit submit. Your request will be sent to a monash.figshare administrator. Since users accross Monash will have variable storage requirements, the allocated storage will be variable. If you are approaching the maximum of your initially allocated space, you can request more storage. Can I embargo the research output I want to publish until my research paper is published? monash.figshare offers two types of embargo. You can apply the embargo to the files only meaning that the description will be publicly visible but the research files themselves will not be. You can also apply the embargo to the whole item meaning that both the description and the research files will not be publicly available until the embargo has expired. You can embargo the research output either by a set period (1 month, 4 months, 6 months, 12 months or 2 years) or by using the calendar to select a specific date. Regardless of which method you choose, the published item will clearly state that an embargo currently applies, and provide the date the embargo ends. By doing this you will be able to provide the publisher with a DOI of where the data will be made available, without revealing any of your work until you are ready. You can always edit the embargo date as long as the item has not been published. More FAQs are available on the figshare.com site.